If you drive a car, you know that dents and scratches on cars in a part of it. You can be as careful as you want but no one can account for freewheeling shopping carts, fellow drivers barging into your car, tight manoeuvres, and hundred different scenarios that will scuff up your ride. 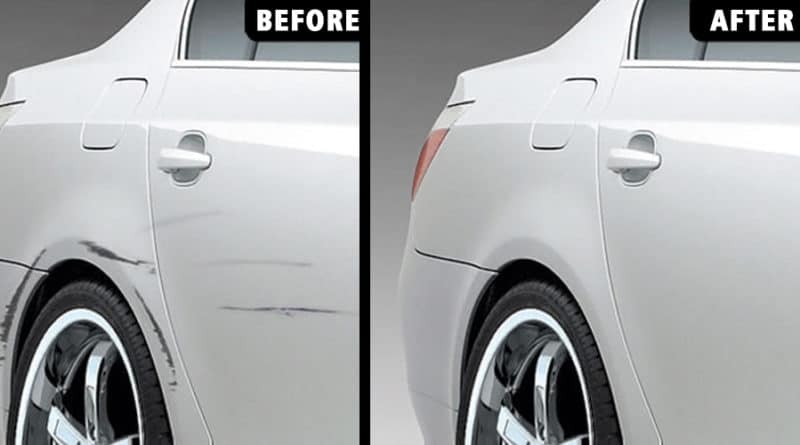 Point is that if you’re reading this you have a dent on your car and want to fix it easily. I get it, no one likes to take their car to a workshop, waste time and money. I am not saying that home DIY fixes will be as good as the workshop quality. But sometimes you just want the damn thing to just look presentable. If the scratch is just skin-deep, then just take a 3000 grit wet sandpaper and some water. Clean the area to ensure there’s not dirt over the panel. Put the sandpaper of the wooden block to distribute force uniformly. Sprinkle some water over the scratch and rub it with sandpaper lightly in a circular motion. Take a break to re-wet the area and continue rubbing until the scratches are gone. Apply a car polish over it to finish it off properly. Mostly whenever your car rubs lightly with another car’s bumper, the paint from the other car sticks onto your car. Now, you might think that it’s a scratch but thankfully it not. All you need to do is remove that layer use a rubbing compound to cut through it. Clean the area, take a dab of paint correction rubbing compound and rub over the area in a circular motion using a cloth. In just few minutes you won’t even notice imperfection. 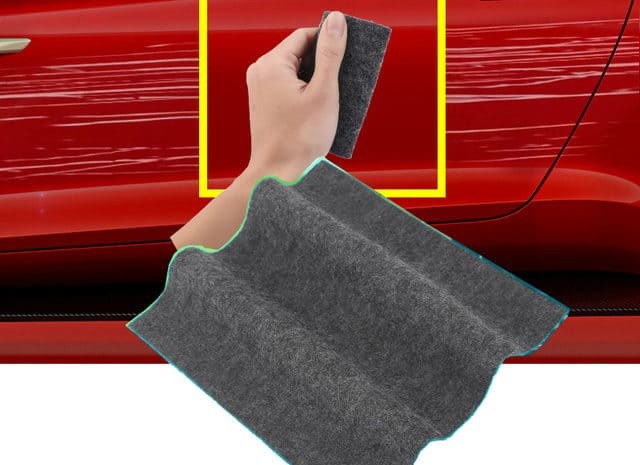 Scratch remover cloth are all rage nowadays because of how easily it fixes dents and scratches. It’s basically an abrasive cloth with either some micro-metal rubbing powered sprinkled onto it. Although a rubbing compound and sandpaper will do the job for you, the scratch remover cloth is just less messy and easier to deal with. I always keep a 4-5 in stock for a quick repair job. Don’t have rubbing compound at hand? Worry not because you must have toothpaste (I’d worry if you don’t :P). Just take a pea-size dab of toothpaste on a damp cloth and rub it over the scratch. Keep rubbing in a circular motion until the scratches disappear. Tip: Tooth Whitening paste works best in this case as it’s most abrasive. Want something easier? Try scratch remover pen. It doesn’t really removes the scratch but fills it with some kind of hardening lacquer. Just run the pen over the scratch and let the liquid fill up the scratch. Let it dry for few minutes and voila the scratch should be invisible now. If the dent on the paint is deep then you might need to apply 2-3 coats of it. Tip: Clean the scratched surface properly before using the repair pen. If you’re in a hurry and just want a temporary repair, then candle wax is your friend. Just rub the wax over the scratched paint until it fills it up. A great tip if you don’t want to drive a scratch up car to an important meeting. 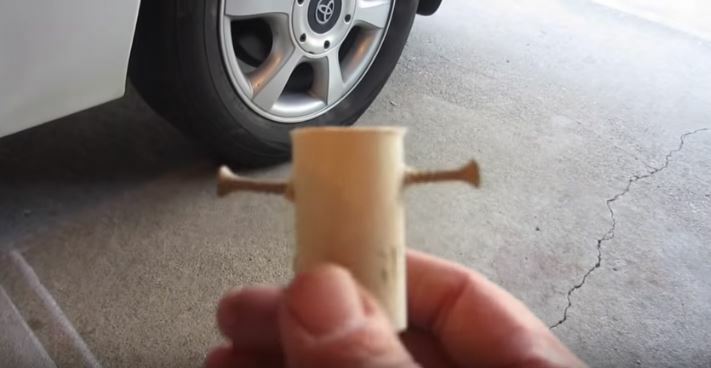 Step-1) Make your puller tool using bottle cork and wood screw. You can also use dowel rod cut to 3-4 inches blocks. Screw on the screw on the side, adjacent to each other. This will allow you to grip the dowel rod properly while pulling out the dent. Step-2 ) Clean the depressed are properly with soapy water. Then take a hot air blower to heat up the dent surface little bit so that sheet metal can easily pop out. You can heat up the glue gun while you are doing all this. Step-3 ) Attach Dowel Rod onto the dented surface with glue gun. Depending on the size of dent, stick several dowel pins on the area. Then let the glue cool down properly for few minutes. Step-4) Start pulling the dowels slowly and watch how the dented area is changing. Keep pulling different dowels based on how you see the dented are changing. Keep repeating it until the dented area comes out nicely. 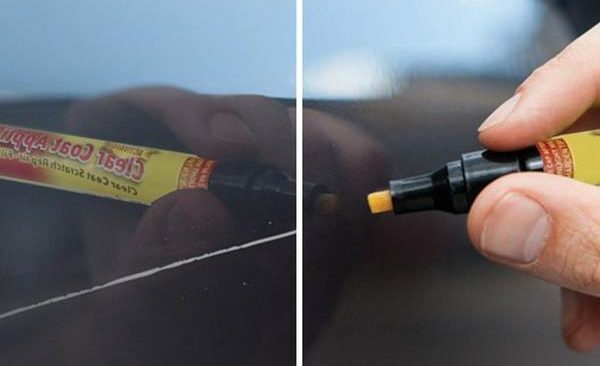 This method works well if you want to fix a large dent in a car door, bonnet or any metal panel . 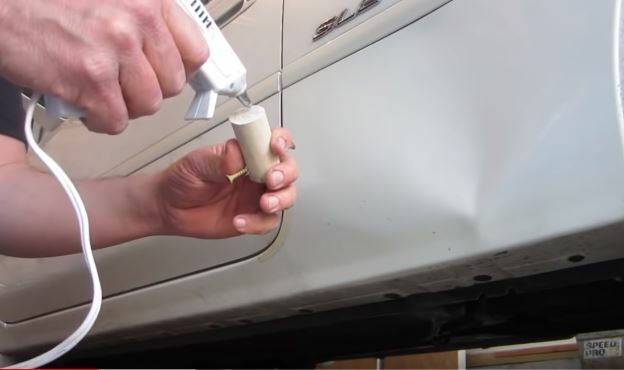 The method mentioned above was complete DIY but there are already DIY dent removal kit available in the market. It can either come with glue gun and pulling tool or pulling tool with small suction cups. The idea behind the repair job is same: You just have to pull out the dented area. While you can use the suction cup or dowel rod method to pull out plastic bumper also, there are 2 easier methods. Boiling water is an age-old old technique to pop out dented bumpers. Take two pots. Fill one with boiling water and the other one with cold water. As a precaution, wear rubber gloves while handling boiling water. 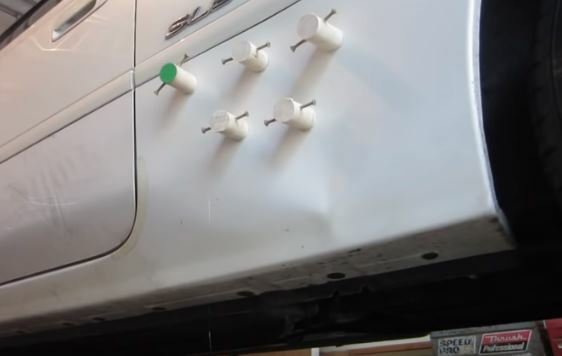 All you need to do is make the dented bumper malleable enough by pouring hot water over the dent. Then reach from the backside and push the dent out. Next, pour the cold water over the bumper to cool it down. If you don’t want to deal with handling hot water, you can also use a hair dryer instead. The concept remains the same: You have to heat up the area enough so that you can pop out the dent. 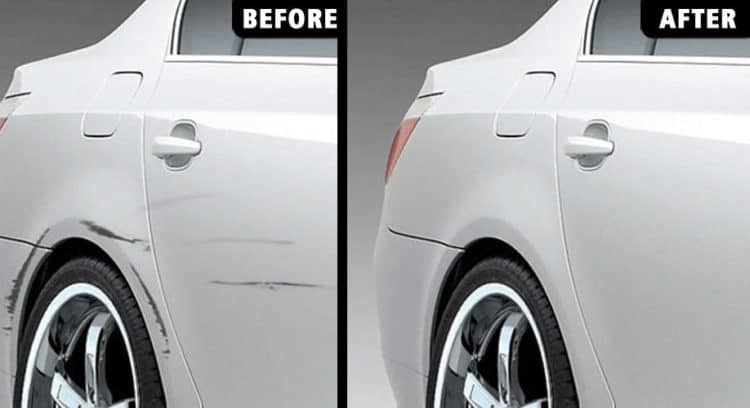 The best way to fix dent and scratches is to just take is to a professional body shop. But like most people, maybe you would rather spend your money to fix the mechanical issues rather than cosmetic. It makes sense because what’s the use of a shiny vehicle that doesn’t run well. Then there’s the other lot of people that just find it satisfying to DIY everything on their car. 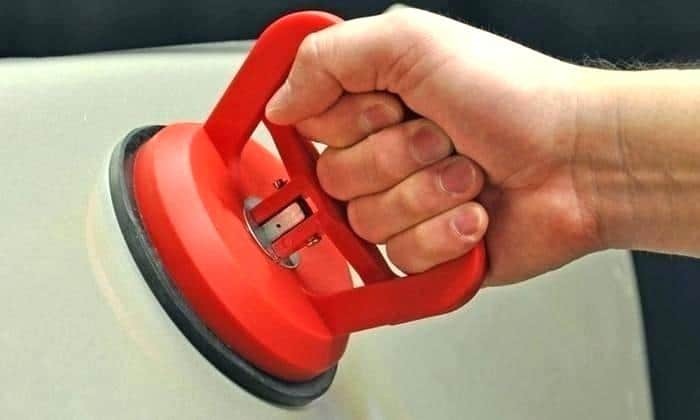 Fixing a dented car is a perfect opportunity for that.